Will the trek across the Ben Franklin Bridge, the most iconic structure in Camden and a looming presence in Old City Philadelphia, prove to be a bridge too far for many pilgrims? Hard to say, as with most issues involving Popefest. But this much is certain: Reaching Philadelphia from South Jersey will be challenging the weekend of Sept 26-27, as Pope Francis visits the city amid a huge security clampdown. The challenge begins with the closing of the Ben Franklin Bridge to vehicles that entire weekend. Normally, the bridge carries more than 100,000 vehicles a day. PATCO trains, pedestrians and cyclists also use the bridge regularly. During Popefest, a special PATCO pass is required and must be bought in advance. The PATCO rail lines that run on tracks paralleling the bridge, will have many stations closed during that weekend. That will push New Jersey commuters to lots at select stations that are bound to jam up early – and stay that way throughout the weekend. That’s why some officials are touting the Ben as a path to a true pilgrimage: a walk across the 1.5 mile span from Camden to Philadelphia. Total weight: Approximately 1.5 billion pounds. More from the DRPA here. But not so fast, pilgrim: There’s getting to the bridge in the first place, finding secure parking in Camden, passing through checkpoints. One New Jersey Department of Transportation consultant has made the trek sound only slightly better than the Bataan Death March, advising bringing flashlights for a return walk in the dark, spare cell phone batteries, carrying extra meds and being prepared for long waits due to crowds and security screening procedures. And the aged and infirm have no reason to even consider using the bridge, the consultant said. It's as if he were talking to me: AARP keeps sending me membership forms to throw out. And I have a replacement hip, thanks to an accident when I was 20-years-old. But what the heck, I’m a gamer. In fact, taking a practice trek across the bridge was my idea. While details, including just how large the crowd of pedestrians might be and how long the screenings will take remain unclear, my editor at PhillyVoice decided we could at least tell readers what a walk across the bridge is like on a regular day. The walk begins in Camden, the poorest city in America, according to the U.S. Census, and a city with violent crime challenges. That leads to worries about adequate parking, safety, and simply getting to the bridge in Camden. After all, the PATCO stop nearest the bridge emerges from underground right in front of a methadone clinic. Concerned about crowds and safety, officials are planning to create official pathways for papal weekend, but last week I was on my own. The walk to the foot of the bridge took fewer than 10 minutes, a quiet and safe trek through Downtown and the campus of Rutgers University-Camden. 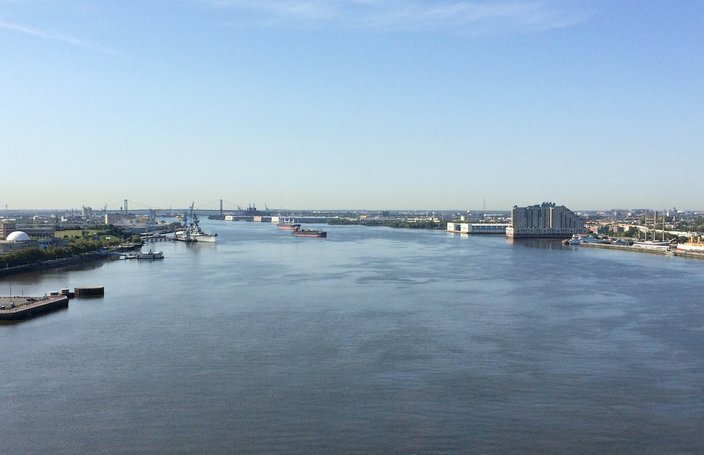 The day I walked, the southern pedestrian path along the bridge was open, with PATCO trains rumbling beneath and traffic humming below. The weather was glorious, blue skies, low humidity and not too hot. Below, the neat campus of Rutgers and the green of Campbell’s Field spread beneath my feet. The incline at each end of the bridge is gentle, but persistent. Chrisanda Johnson, 49, likes that incline. She crosses the bridge for fun and health several times a week. She offered the usual tips: Comfortable shoes, water, a hat, sunscreen and music. She’s big on Beyonce as a motivator. A non-Catholic, she says she may try and hear the pope Sunday when he speaks at Independence Hall, not far from her usual Sunday walking route. At the halfway point, the walkway widens out. And there, a tiny electric Smart Car, comically outfitted in the black and white colors of a Delaware River Port Authority cop car, delicately maneuvered, making K-turn after K-turn to spin the golf cart-sized vehicle around to face toward Philadelphia. As I watch the car make its maneuver, sweat pops out on my forehead and it's hard to say if it is caused by exertion or concern for the oversized driver in the undersized vehicle. The Smart Car, able to squeeze down the narrow pedestrian walk, went into service just a few weeks ago. Beneath the span, freighters, the Coast Guard and pleasure boats move up and down the river dividing New Jersey from Pennsylvania. 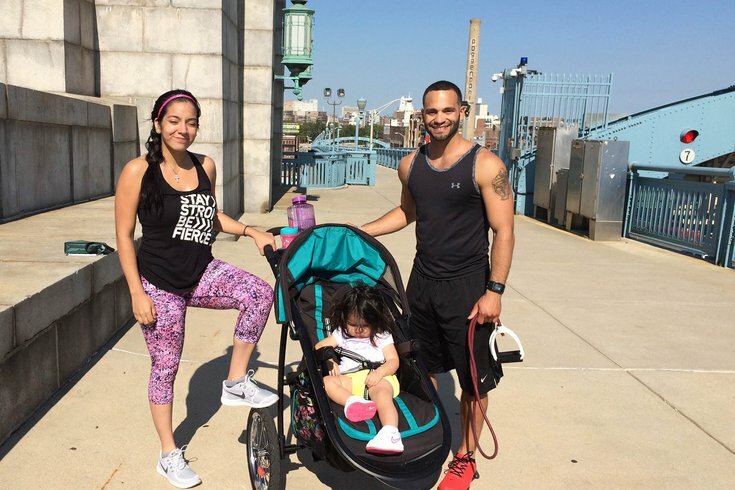 On the downslope to Pennsylvania, there is a young woman working out with a trainer as her toddler sits securely in a baby carriage. The woman, it turns out, is Ana Solano, wife of Phillies shortstop Freddy Galvis. The couple’s child, Anastasia Galvis, is in the carriage. Her trainer, Giovanni Romero, uses the bridge often in his training, but Friday was the first time Solano had come to the span for her workout. Solano, who lives in a waterside tower upriver, said being on the bridge is both “beautiful and shocking,” a great experience. 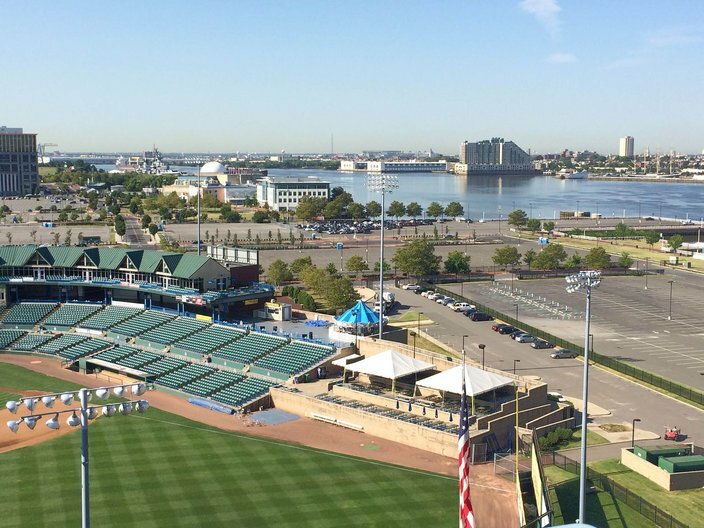 Romero said overlooking Philadelphia, the Delaware River and Camden offered a spiritual component to their morning workout. She nodded as he explained that crossing the huge bridge, suspended over water, meant conquering a degree of fear, a part of spiritual growth: a perfect warm-up for seeing the pope. Solano and Romero are both excited Pope Francis is coming to Philadelphia. She said she hopes to catch a glimpse of the pope while he's in the city, but will avoid the big events due to the hype about the crowds. There really is something about being suspended above the Delaware River. Still, it feels good to reach the terminus on the Philly side, marked by a steel lightning bolt meant to pay homage to the bridge's namesake. And then it is back over the bridge again. Without stops, the walk at my pace – AARP-eligible, a titanium and ceramic hip, lugging two water bottles – took about 30 minutes. While crossing on the weekend of the pope's visit, surrounded by thousands of others, subjected to cattle chute walkways and security screenings, is likely to change the equation, the walk felt good.